This level has medium difficulty. 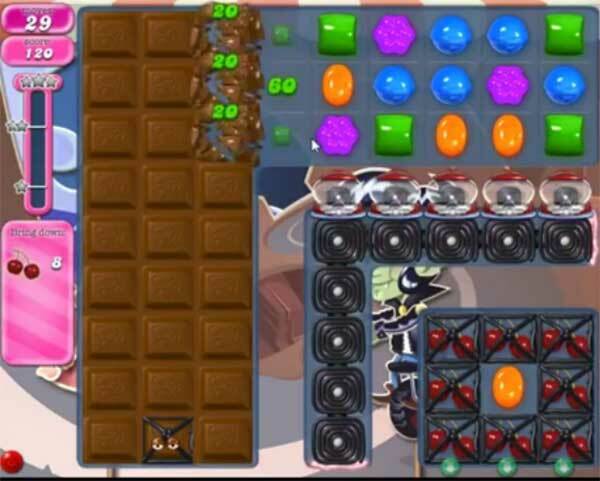 For this level try to play from top left part of the table where more candies are available to play and make special candy combo. Combine striped candy with colorbomb or wrapped candy to break more jelly blockers. Or use from to break the grills to take ingredients out from the table. Or take help from the video below. Do you need a mouse to move the frog? I’m using a kindle and I can’t move the frog. Any ideas? passed 1st try, was one of the easiest levels went back and played again , got it again and bettered my score and 3 stars. just ignore the licorice and just break the chocolate, try to get a color bomb and use it on the same color as the frog that will fill the frog and move it in the middle of the cherry’s it will take them all down.